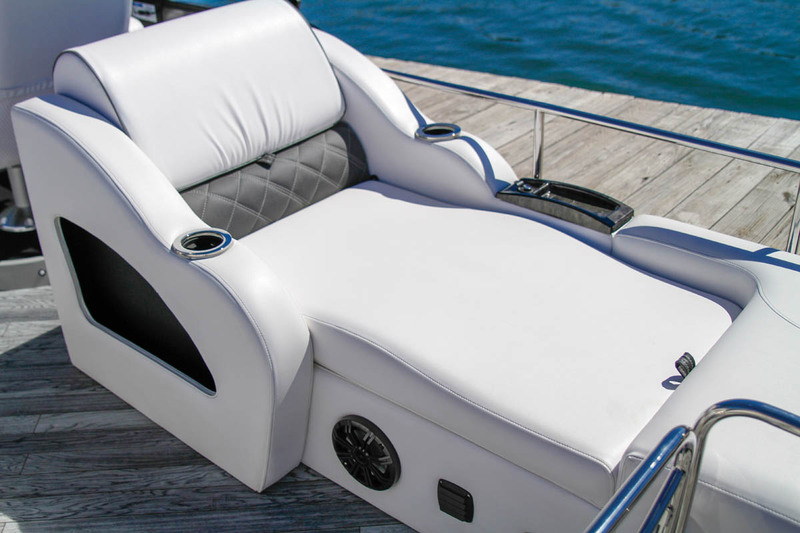 The first-class cabin at G3 pontoons just got a lot more plush and stylish. 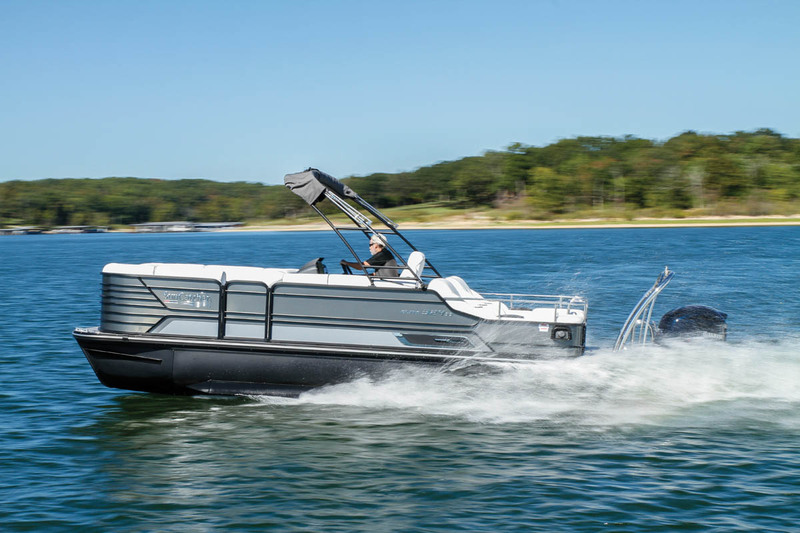 For SunCatcher pontoons, the Elite Series has always been its luxury gold standard, but with the new Diamond Elite, the Yamaha-owned division of G3 found a way to up the ante and create a new class of luxury. The new-for-2017 Diamond Elite 324SS we tested was a visually stunning exploration of the entire grayscale spectrum, from black to white. And while there may not have been 50 shades of gray in between, I saw at least five. Even the logs were a black powder-coated hue — a first for SunCatcher, as was the charcoal anodized aluminum fencing. Add pewter with harbor gray graphics and slanted-board, weather-grayed flooring from Aqua Tread, and the look is complete. Other fence color choices and interior schemes are available, but ours had an understated elegance. The line’s all-new furniture features pillow-tops and a leather-feel vinyl in immaculate white with gray (what else?) panels that feature alternating white single, double and triple stitching. The vinyl fabric itself was eerily cool on a blazing hot day on Table Rock Lake, near Branson, Mo. — almost like air conditioning for the skin. 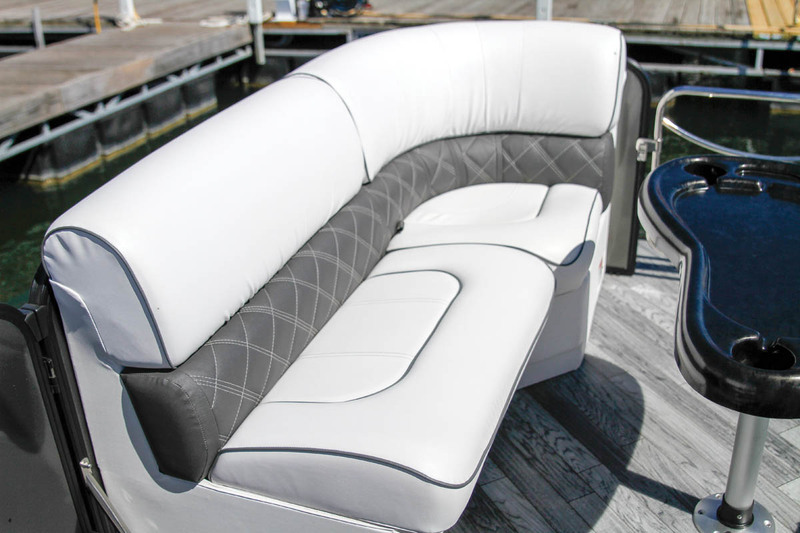 In addition to twin rear-facing recliners, the layout features a portside layback seat across from the captain that can be linked to the abbreviated forward sofa with a gate-filler sectional to create a really long couch. There’s a fourth chaise lounge in front of the captain. To add some diamond flash to this absence-of-color design scheme, all the hardware is polished stainless steel, from the stout soccer goal ski tow to the boarding ladder and its swimming pool–style grabrails. Unique to this line are the custom bow and stern boarding gates that have the SunCatcher name cut out of an oval plate. 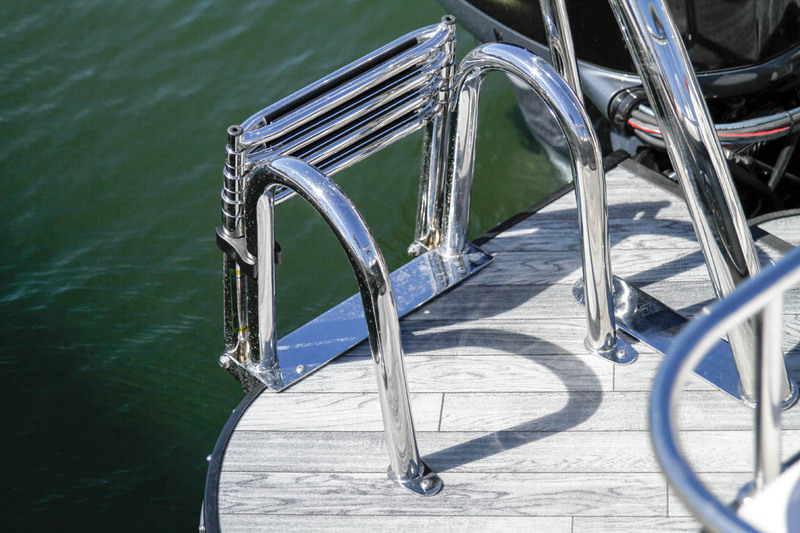 The stern gate blends seamlessly into the stainless steel grabrails that circle the aft third of the boat. About the only place I didn’t care for this chrome blitz was on the steering wheel, which tended to reflect the sun into my eyes as I drove. Since SunCatcher is a Yamaha company, don’t expect to see another engine brand on the transom. The 23-foot, 10-inch 324SS is rated to handle up to 250 hp. Every Diamond Elite model comes standard with triple 23-by-25-inch U-shaped tubes that have closed-cell foam inside to maintain flotation even in the event of a breach. Given that triple tubes are standard, it’s a little puzzling to discover the engine choices start with an F90. There’s a special price of $67,995 for a Diamond Elite 324 with an F115, but don’t bite on that combo either. The minimum power buyers should get is an F150, but even that won’t do this boat justice. Our test boat had the V MAX SHO 225 on it, which showed off the boat’s potential nicely. Even with this hotrod of an engine, the MSRP is still a reasonable $77,495. The builder rigged the engine nicely, tucking the hoses and wires neatly underneath the ample swim platform. While the 4.2L V-6 motor was originally designed for bass boats, its punch out of the hole was not wasted on this boat. Thanks to features such as Variable Camshaft Timing, when I slammed the throttle the boat really jumped, as evidenced by its time to plane of 2.4 seconds. The trip to 30 mph took just 6.3 seconds, and the Yamaha’s midrange throttle response was excellent. Top speed was 44.4 mph. Since the V MAX SHO 250 is essentially the same engine as the 225 with no weight penalty, I would go for the big MAX when choosing engines. 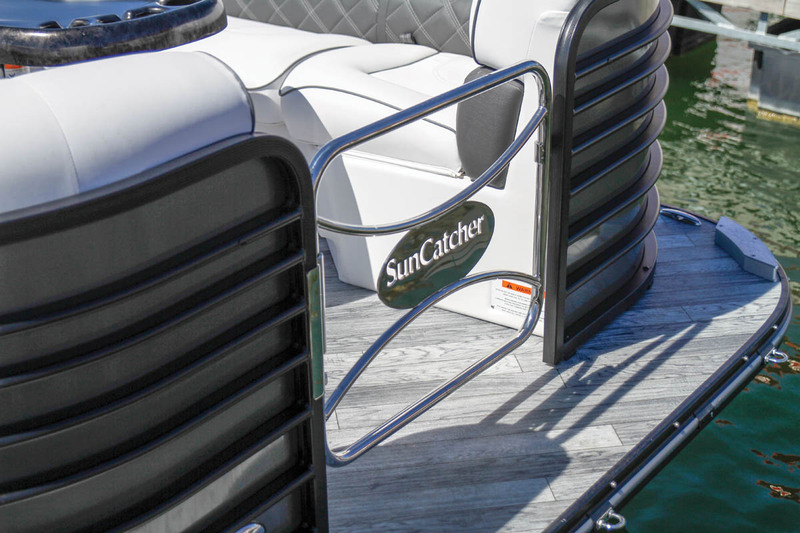 With two performance lifting strakes on both sides of each tube, this pontoon gets on top of the water quickly and stays there even at slower speeds, which comes in handy for towing really young kids on tubes. All that lift helps it ride high and dry over the chop and reduces the potential of submarining when it crosses large wakes. Strakes on the outside of the outer tubes deliver some pushback in hard corners that keeps the 324SS’s deck parallel to the water in hard turns — to the right, at least. For some weird reason, probably owing to prop torque, there is a tiny bit of outward lean during left-hand turns. But in either direction, the driver can crank a satisfyingly hard corner without losing traction or prop bite. The 324SS responds well to trim and it’s easy to get the front of the tubes out of the water, to reduce drag and increase speed. 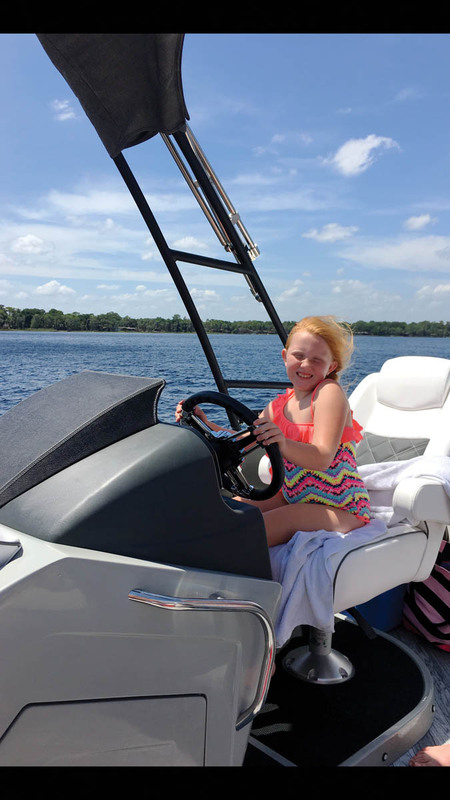 And the standard SeaStar power steering system means mom and dad can tow the kids on tubes all day and not break a sweat. With the gleaming hardware on the stern, this boat is ready for any watersport, except wakesurfing. Because the 324SS rides so high in the water, it throws a very flat wake at 30 mph, making it an excellent slalom boat. The flat wake will be kid-friendly for tubing, too, because they won’t go airborne every time dad pushes the throttle. At wakeboard speeds around 20 mph, the driver can boost the wake a bit by trimming the motor up. While not huge, it’s enough wake for young boarders to develop their wake-jumping technique. There is a standard black powder-coated forward-swept tower, but it’s just the frame for the Sunbrella Bimini top. With twin rear-facing luxury recliners, ski spotting has never been more comfortable. SunChaser designers wisely resisted the trendy urge to include faux-headrests that jab lounging passengers mid-shoulder blade. Instead, the seatback, which is perfectly angled, actually contours to the human form. Underneath the portside recliner is a cavernous storage area, but there’s less room under the one behind the captain because of the twin batteries residing there. A centerline in-tube locker makes up for some of that lost storage, and it even has its own bilge pump to keep it dry. 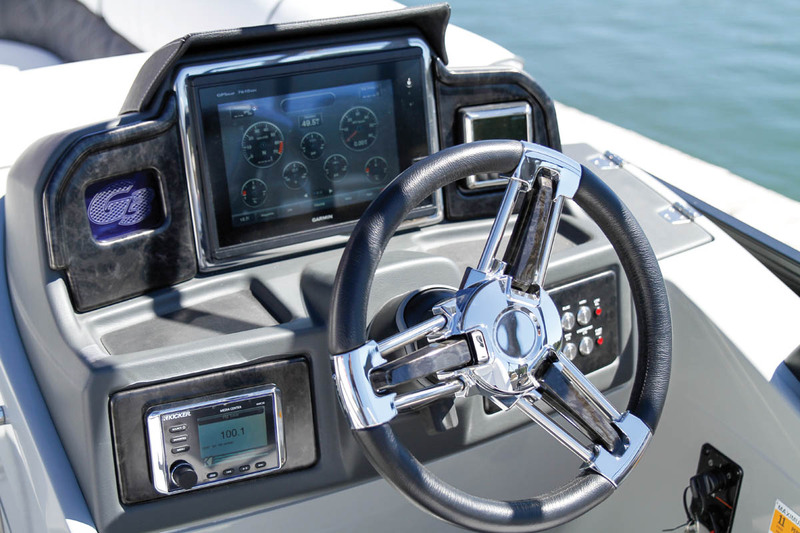 The captain sits at a well-designed helm station that’s raised for better visibility and includes a Garmin GPSmap 7610 XSV for navigation and Garmin’s 73 DownVü, which provides a near-photographic view of what’s beneath the boat. Normally by now, readers would have seen a bunch of parentheses around the prices of the options, but most everything mentioned — including the 10-inch color display — is a standard feature. The 324SS comes loaded for entertaining with a premium Kicker stereo and six lighted speakers and a subwoofer. It’s perfect for nighttime cruises thanks to blue interior mood lighting and RGB LED underdeck lighting with changing colors that anyone can control with a smartphone app. Buyers who want a bar boat should look at the 324SS’s sister ship in the Diamond Elite series, the slightly longer 326SS. About the only must-have options are a trailer, a mooring cover, a filler sectional for the forward or port gates, and a bow Bimini top. Purchased by James and Wendy Brewer, plus Mason, 11, and Haven, 8, Winter Garden, Fla. The Kicker speakers and stereo are awesome, but I’ve had JL Audio stereos in every one of my vehicles, so when these speakers get older, I’ll change them. Although we’ve been on a lot of boats, this is the first one we’ve ever owned, so we did lots of research before buying. There was a little bit of sticker shock on some of the models we liked, but when we went into Sonny’s Marine we loved the SunCatcher Diamond Elite 324SS with the black/white/gray color scheme that matched my truck. Orlando has countless boating opportunities, but we really like the Clermont Chain of Lakes, which has 13 lakes of all sizes. Mason and Haven love tubing and kneeboarding and also want to learn to waterski. We like to anchor and swim or take nighttime cruises with our friends. Sonny’s Marine is a family-run business and they treat you like you are part of their family. 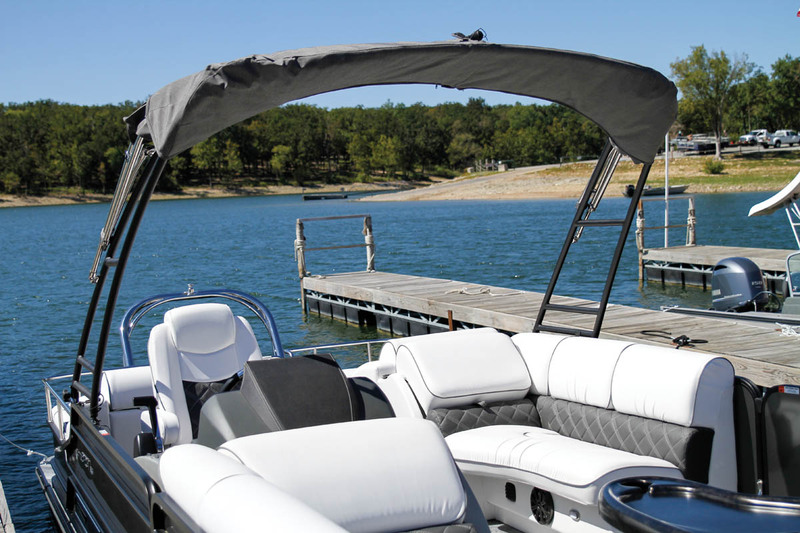 I was new to boating, but Keith answered all my questions and put no pressure on me to buy. I took my boat in for its first scheduled service and they detailed my boat and gave me some equipment I needed for a road trip at no extra cost. LOA: 23 ft., 10 in. Beam: 8 ft., 6 in.